Strangely, the malls that we have some degree of personal attachment to seem like the hardest ones to post. Neither Prangeway nor I have posted the ones closest to our houses yet, for example, and although I have a cache of photos of malls all over the country, I don’t have a lot of the ones in the Bay Area (where I actually live) yet. Possibly that’s why it took so long to get around to posting the Northshore Mall, a massive super-regional mall on the north shore of Massachusetts, approximately 25 miles northeast of Boston. For about four years from 2001 to 2005, I worked in a Newbury Comics record store just a quarter of a mile down the street from this mall, so I was here all the time, whether it was to scarf down some Umi from the food court to lunch, or just to pick up some new shirts after work. To this day, I can’t go to this mall without spotting a bunch of familiar faces–maybe not necessarily people I know personally, but people I remember as customers at my record store. I was way into malls well before my stint working in the shadows of one, but I was never as immersed in mall culture as much as I was during that era. As a result, I still have some pretty warm, fuzzy feelings about the people in that area. 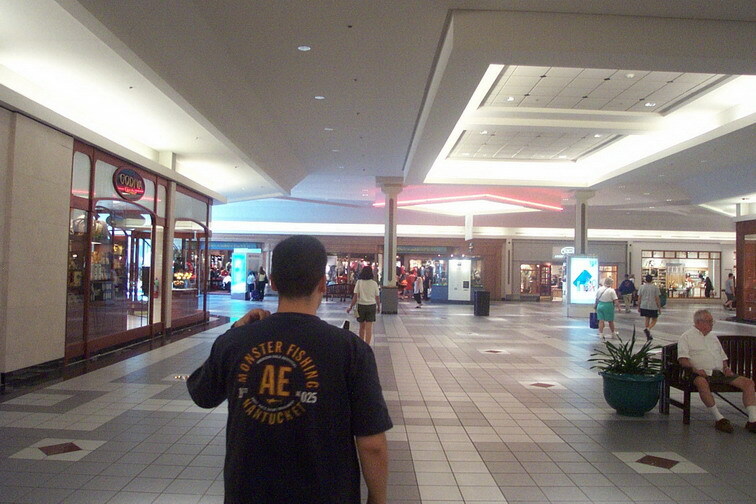 In addition to all of this, the Northshore Mall is one of the oldest malls in New England. 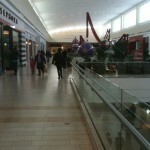 At 1,684,718 square feet, it’s also one of the largest malls in New England. 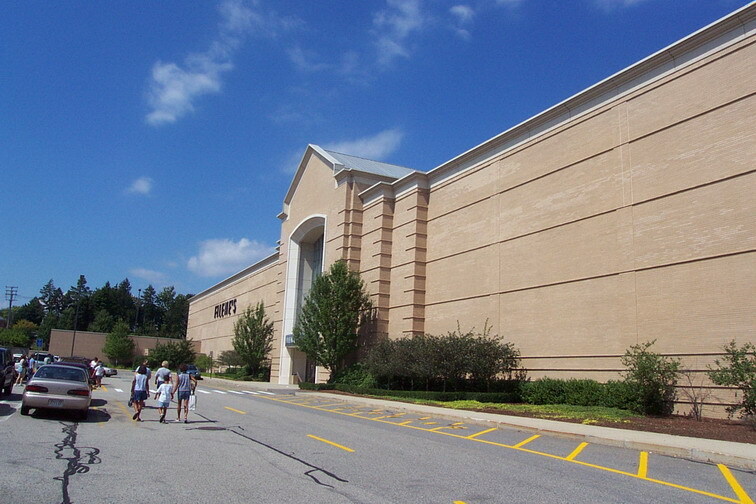 At a time, when the mall still had its gargantuan old Jordan Marsh store, it was even larger. 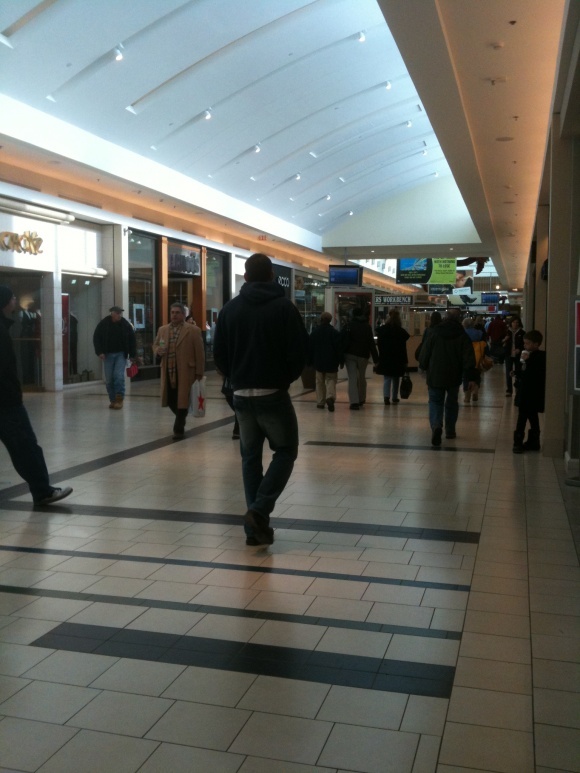 For a brief time, it was the largest overall mall in New England, even, which is strange since (aside from anchor stores) the mall exists primarily on a single level and only has around 120 stores. But like many old behemoth malls built in the northeast, Northshore had so many hulking anchor stores that the total square footage was very significant. In short, though, this mall has been through so many changes over the years, it’ll make your head spin. And it just recently changed significantly all over again. Let’s dig into the details. Peabody, Massachusetts is a large suburb about a half an hour north of Boston, centrally located amongst a cluster of densely populated cities and suburbs that date to colonial times. Salem, made famous for its witch trials, is located only a few miles from the mall, and other storied New England seaside cities such as Gloucester, Rockport, Beverly, and Newburyport are all in this economically diverse, somewhat-suburban, somewhat self-contained region north of Boston. 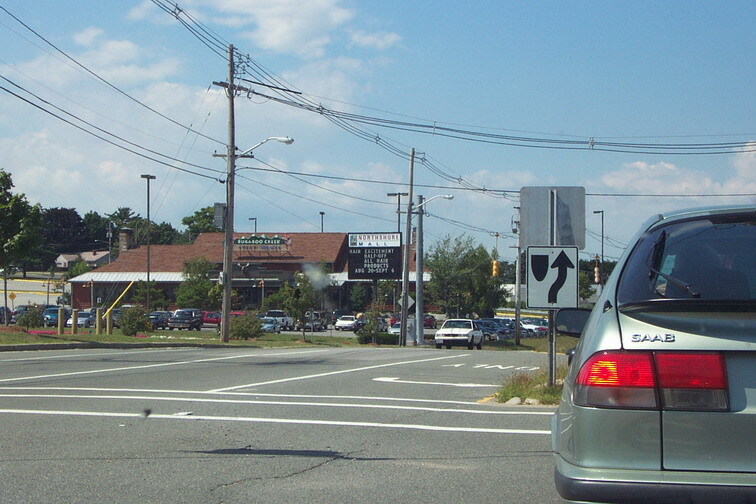 In the post-war era, the area began to change, with increased suburbanization in all directions, due in large part to the recently-constructed route 128 beltway and Interstate 95. Although the region has gone through many changes over the years, much of the area today would still be recognizable to a resident from 50 years ago due to the historicity/preservation of the cities, and zoning policies that have mostly preserved the rural character of the less-developed (and subsequently, fairly affluent) towns in the area. 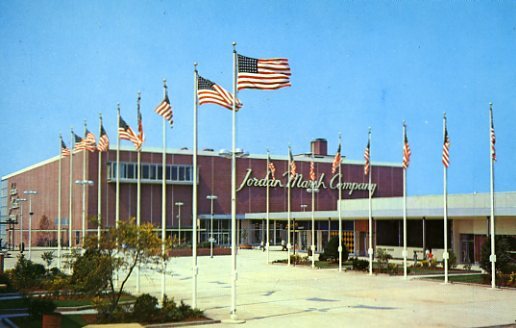 The Northshore Mall was originally developed on route 114 in Peabody, Massachusetts, by Allied Stores (then parent of Jordan Marsh) as a completely outdoor shopping center in 1958, replacing an old estate with gardens, fountains, and a farm. The center had actually been planned as early as the late 1940s for a different site in nearby Beverly (and some books on retail history, including at least one Victor Gruen book, have renderings of this original proposal), but this site was later chosen for unknown reasons. It’s likely that developers knew even then that the site was very strategic: it offers great access to freeways and both the long-established, dense cities clustered along the north shore but also to the many then-burgeoning suburban areas further inland to the west. Originally, the center was anchored by a large, four-story Jordan Marsh store, as well as a smaller (adjoining) Filene’s store, along with Kresge, J.J. Newberry, RH Stearns, and Stop & Shop. 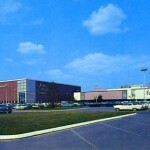 The center was truly multi-purpose, also featuring a small amusement park, a cinema, and a bowling alley. 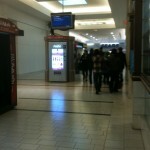 The mall was also developed with a then-unique underground delivery tunnel running the length of the mall. At the time, snow removal for the main concourse of the outdoor mall was performed by dropping snow onto trucks in the tunnel and trucking it out of the center. In 1960, the St. Therese Society of Mt. Carmel Chapel opened in the mall’s basement, becoming the first chapel in a shopping mall (and paving the way for another Carmelite chapel to be opened later, in New Jersey’s Bergen Mall). Sometime during the 1970s, a Sears anchor was added to the front of the center. 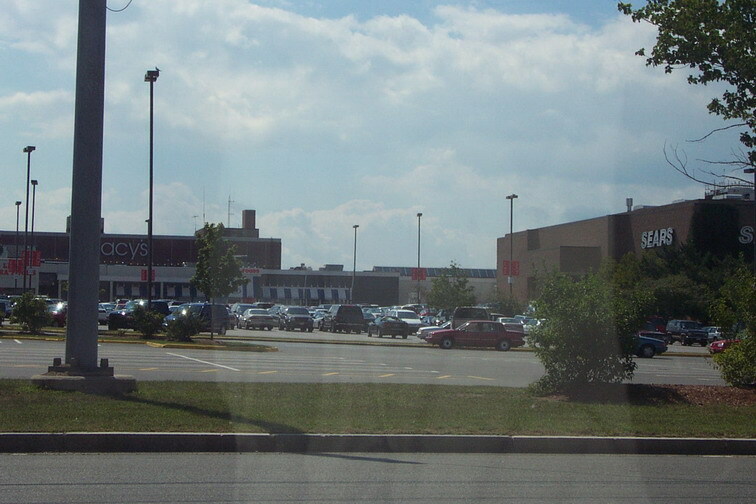 In 1972, New England Development constructed the Liberty Tree Mall, a fully-enclosed 1 million square foot center, only a half a mile away from Northshore Mall. 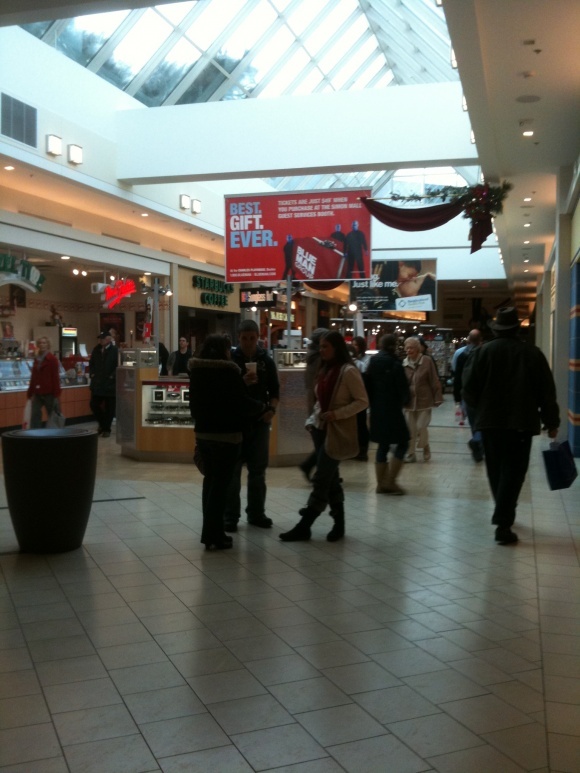 The new enclosed mall made an immediate splash and became a major shopping destination, despite not having a similar roster of old-line department stores like Jordan Marsh and Filene’s (Liberty Tree sported a far more middle-tier blend of stores like Ann & Hope and Lechmere). 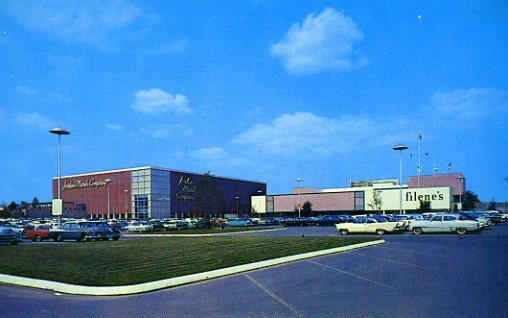 In response, the Northshore Mall slowly began to enclose, beginning with a small section near Sears and ultimately enclosing the entire center. In 1986, Allied sold the Northshore Mall to Edward J. DeBartolo Sr., who in turn sold it to New England Development in 1992. 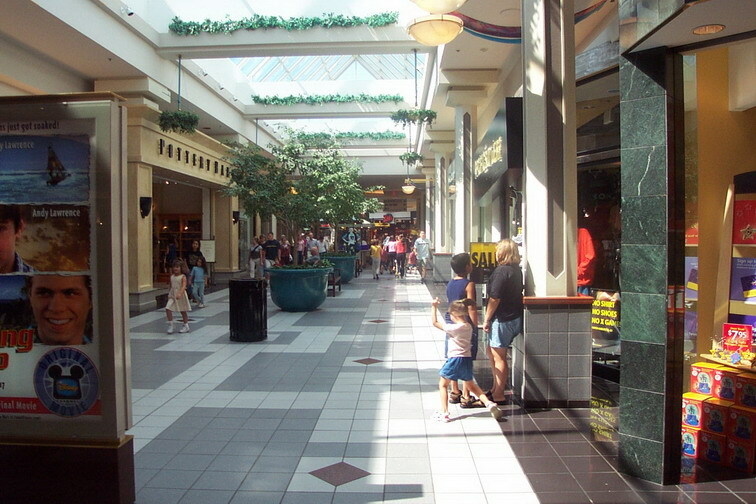 As New England Development now owned both of the large, competing malls, they began a major expansion and renovation of the Northshore Mall that increased the size of the mall considerably. Filene’s moved their store to a new location at the western end of the mall, and a new Lord & Taylor store was added to that side of the mall as well. The original Filene’s space was filled with JCPenney–still somewhat of a rarity in the Boston area, even today–and the entire center was given a modern refresh with skylights and a food court. 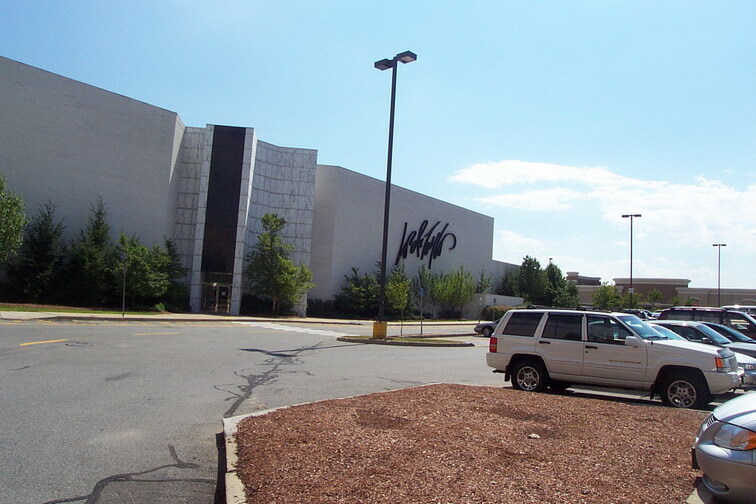 Other than a sale of both malls to Simon in 1999, the only change at Northshore until the mid-2000s was the re-bannering of Jordan Marsh to Macy’s in 1996. In 2005, after the Federated-May merger, things began to get very interesting again. 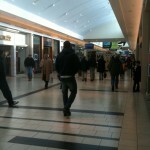 Post-merger, May had three stores at the Northshore Mall, occupying nearly half of the square footage of the entire mall. Especially troubling was the large, four story Macy’s store, which was one of the last remaining portions of the original 1958 structure. Impractically large for a one-level mall, Federated made the decision to close the store and move Macy’s to the former Filene’s space. At about the same time, they decided to shut the mall’s Lord & Taylor store, leaving two anchors at the mall completely dark. This would be somewhat temporary, however, as Federated soon split out the Macy’s store into two locations, with Mens & Home moving into the former Lord & Taylor. The former Macy’s, however, was an entirely different story. 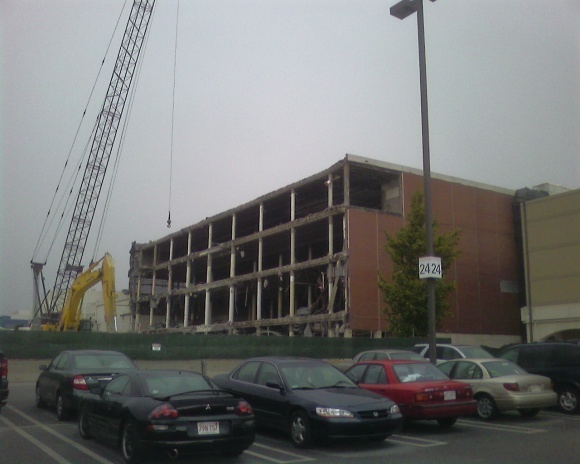 Simon landed Nordstrom as a replacement tenant, but rather than trying to occupy part of the over-large old Jordan Marsh space, the 50 year old anchor was demolished entirely. Simon built an entire new two-level wing (in contrast to the mall’s single-level orientation) with soaring skylights and new tenants including Zara and Forever 21 to lead to the new Nordstrom store, and the expansion opened in November 2009. 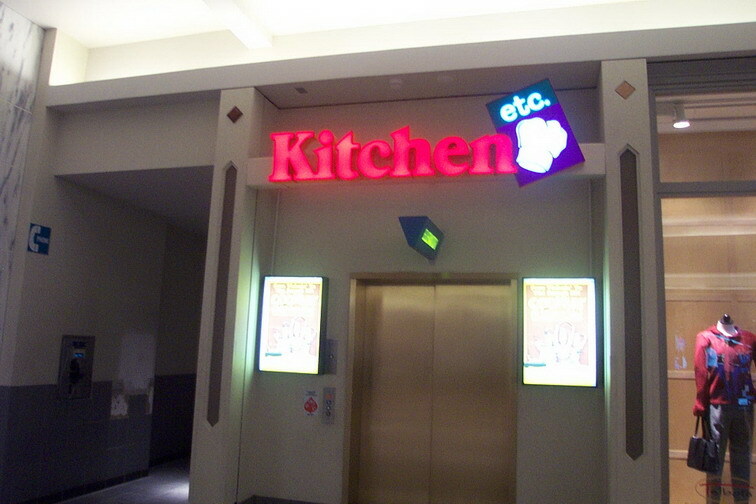 Interestingly, disconnected portions of the basement have had stores at various times in the mall’s history. There’s a small, abandoned space that once housed a Kitchen Etc (and was accessible only from outside or by elevator), tucked next to the former Lord & Taylor. 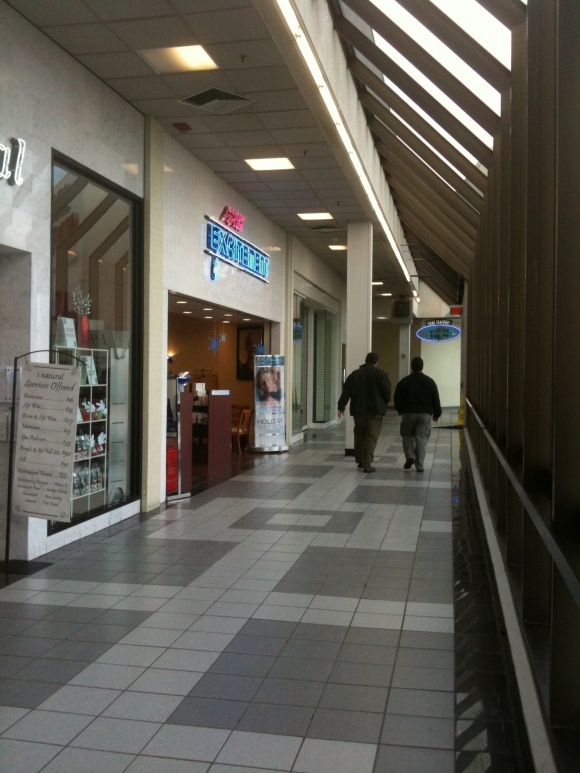 The Carmelite Chapel still operates in a small portion of the basement towards the front of the mall, and there is a small basement area underneath the food court with Filene’s Basement and a golf store. At the center court, there is a small basement level that once housed Sam Goody; today it has access to both Forever 21 and H&M. 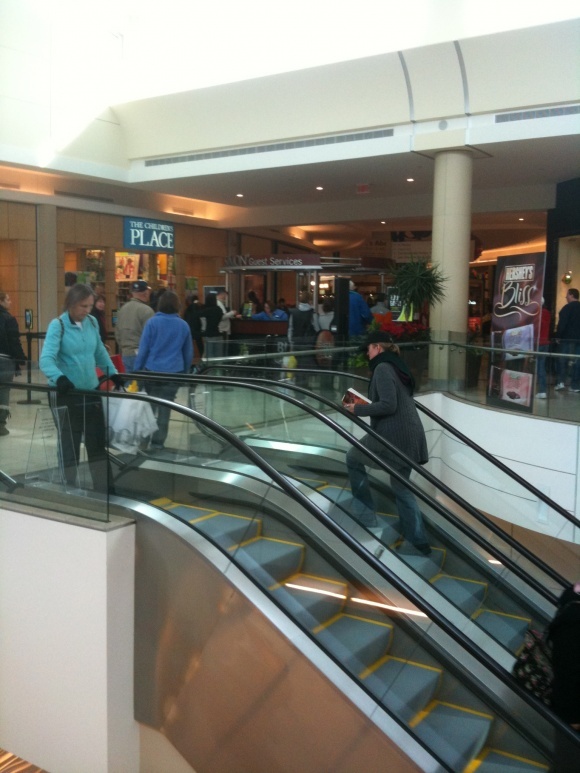 The first level of the new two level wing is also at the basement level of the mall, but does not connect directly with other portions of the basement. Are you confused? You should be. Although I always thought of the Northshore Mall as pretty straightforward (and I went to the place often enough that I got pretty darn bored of it), a lot of the recent expansions have transformed the floorplan into something of an oddity. We have something of a soft spot for malls that randomly sprout new levels (*cough* Merle Hay) and the way the new wing opens dramatically and unexpectedly from the narrow, twisty main corridor is kind of a fun surprise. There are a lot of random photos of this mall. Most date from two trips: the first ten are from one in summer 2001, and most of the rest from another in December 2009 after the most recent expansion. There are also several old shots taken from old postcards of the mall, one aerial shot (from Bing Bird’s Eye view), and one shot of the old Jordan Marsh store mid-demolition in September 2007. Wow! 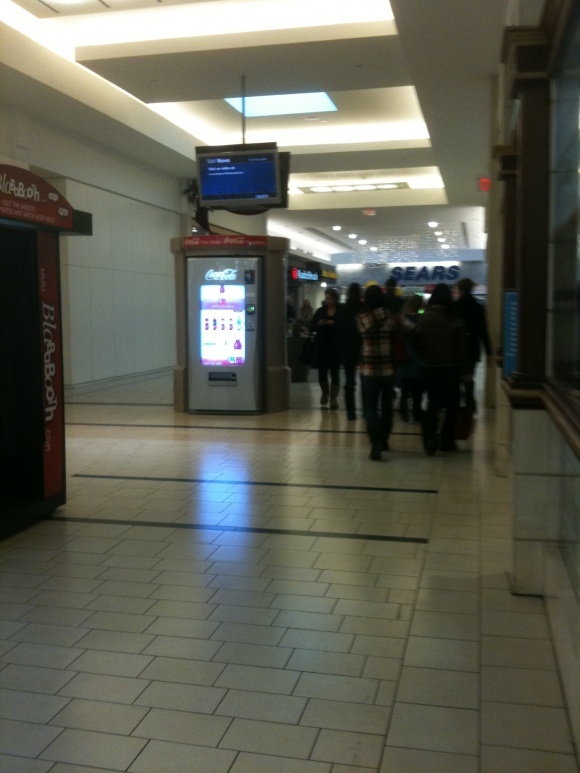 I was just at this mall Sunday! My son asked if you guys ever did a piece on this mall, too. This and the Liberty Tree Mall was were I spent a lot of time growing up. I saw many movies in the non-connected to the Mall Loews (I think it was Lowes) theatre that is now where the Barnes and Noble stands. When I was 6 years old, due to my 3 year old sister’s meddling with the buttons I was trapped in an elevator in the old Jordan Marsh building for a good hour. 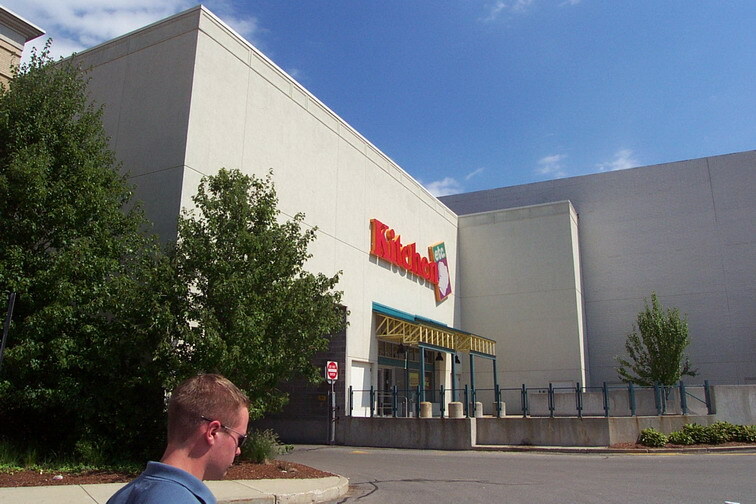 I believe this mall also housed the only “Tape World” store I remember in the greater Boston area. Over the years this mall went more “upscale” while the Liberty tree went a bit further downscale. 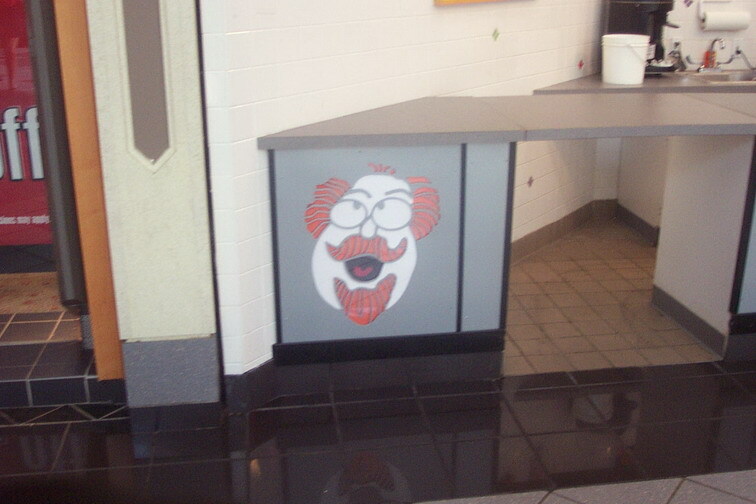 I’ve seen the middle Microsoft picture before (it was on the article on what to do with redundant Macy’s stores). 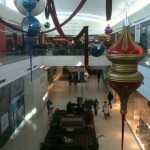 Also, don’t you hate the tacky giant ornaments they hang on malls around Christmastime? Yuck! It’s a shame they couldn’t have re-used that old Jordan Marsh, but I’m glad to hear that a mall of this vintage is still going strong. 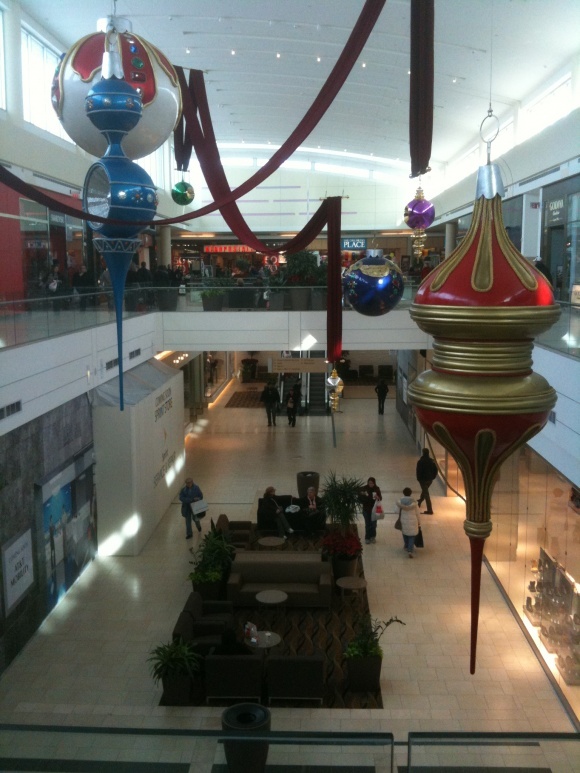 Personally, I like the giant ornaments, but that’s just me. Malls used to be interesting and unique, and vary greatly by region, but it seems like nowadays they all have the same anchors wherever you go … sigh. Basically because anchors merged and as a result, the regional anchors are dead. I do agree and do miss them…especially A&S, John Wanamaker, Filene’s and Jordan Marsh. @mallguy, I know what you mean. On my first trip to Las Vegas in 1994 I stopped into Fashon Show . I Knew of Bullocks & Robbinson’s May, but never visited either until then. Bullocks was nice, but Robbinson’s May was dark & depressing. Shame, Caldor! Shame! As a former Mass resident, you ought to know Danvers (Salem Village) is where the witch trials happened. Fantastic old photos — especially “filenes”. Never knew of their logo from before that art deco 70s one. I just left it at Salem for simplicity’s sake, and it WAS part of the town of Salem at the time, but you’re right about the witch trials actually occurring in modern-day Danvers, which is even CLOSER to the mall. @Caldor, The actual court house where the trials took place is located on Washington street in Salem. Oh my God I am blowing up this whole post, I’m sorry. Why did I not know this website existed sooner. 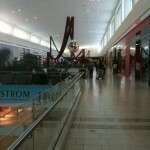 Haven’t been to Northshore Mall since the 1990s. Then, I thought the mall was rather bland. With the pics you provided, it is very impressive what has been done there. How the addition of Nordstrom changes a mall! The mall is at a great location and very visible for those heading out to Cape Ann. 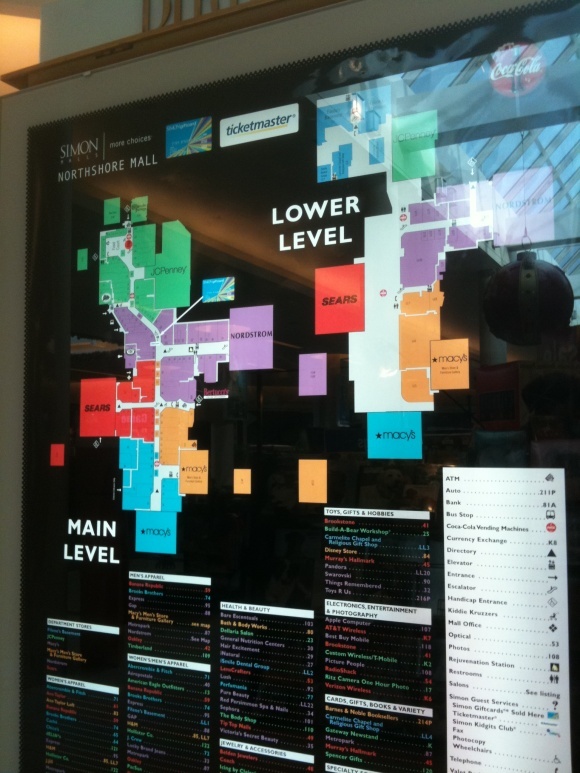 Judging from the mall directory map, would it be possible to make the entire mall two levels? On the lower level portion, I’ve noticed that one side of the hall between the Nordstrom wing to Macy’s has no stores, while the other side does. Is the service tunnel still there? @Gary, I go down there all the time because I work right across from the Nordstom wing. I know this is a VERY delayed comment, but if you happen to still be curious, the old snow tunnels are still down there. Now it’s an entire underground lot that’s used for extra dumpsters for trash. 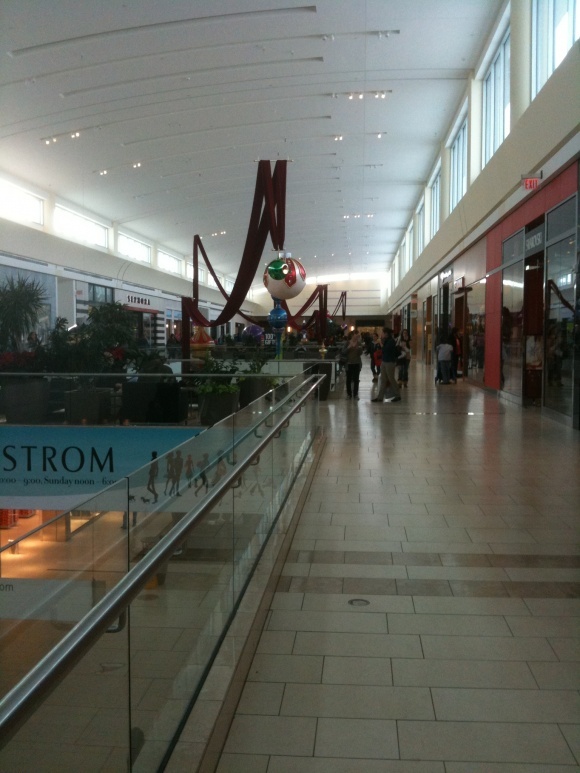 Ive been to this mall twice and its one of the best malls ive ever been to. Great layout, very bright and spacious. PLENTY of stores and variety. Anytime im in the area I always stop there. I went to school at Salem State in 1992, commuting from Burlington. 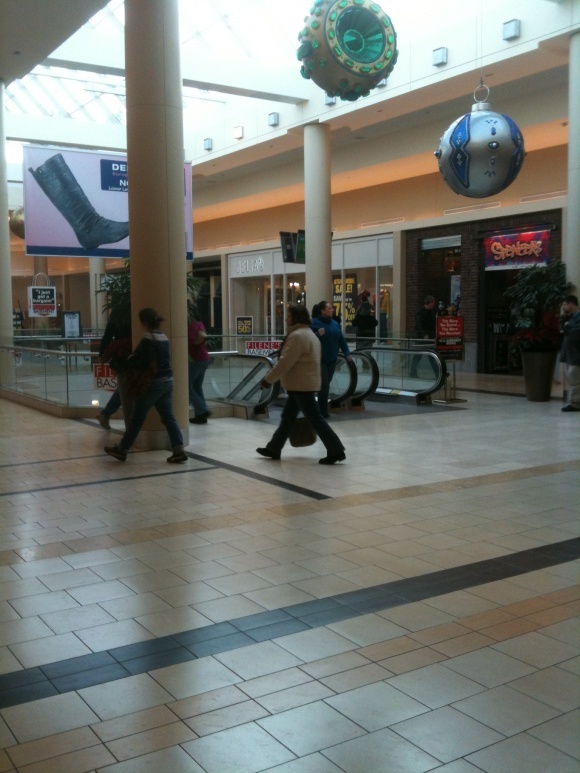 During long breaks between classes, instead of going all the way home, I would go to the North Shore Mall and wander around (forget about studying). 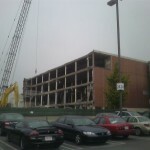 The renovations were just beginning at the start of my freshman year. When would one would walk into the mall, they would walk into 1972, but by the end of that school year, walking into the mall would bring you squarely into 1994 (a full year ahead!). I remember at that time, the mall was legnthened by about a third by gutting the old convention center and extending the main corridor (which ended about where the Jordan Marsh and Filene’s buildings met) into it and building a new neon emblazoned food court within the walls of the former convention center. 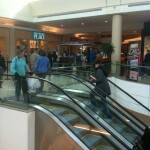 I live in Portland, and do a lot of commenting on the growth of the Maine Mall. People in Portland have been saying they fear the mall isn’t doing well because there’s not as much foot traffic. Well, I was at Peabody this week, and let me tell you – compared to Northshore, South Portland has NOTHING to worry about. This place was nearly empty on the afternoon I was there. You can tell by the configuration of the mall that it’s been piecemealed together from its old days as a shopping center. For me, it’s not as pleasant a place to shop as other malls I’ve seen. 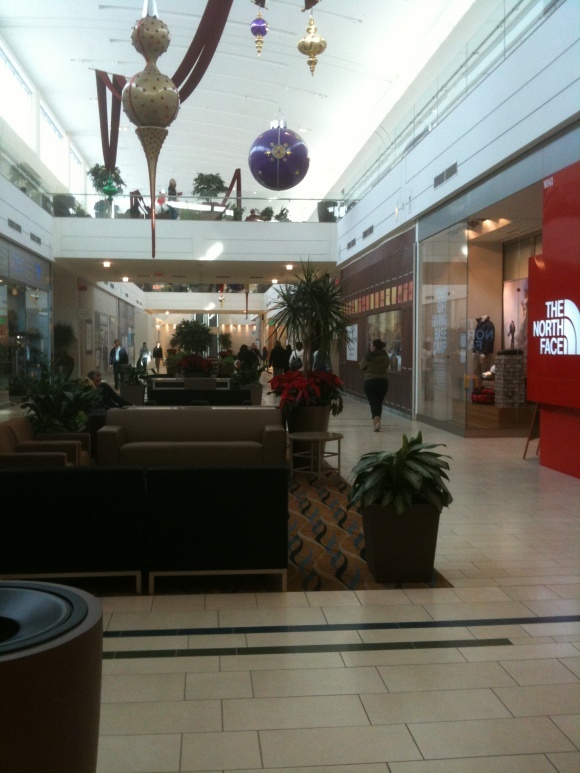 They have nice stores; some of the same new stores the Maine Mall has gotten, but on this day, not as crowded. It’s such a shame NORDSTROM hasn’t built in NH or MAINE yet. I’m sure it would do better than the one here. I was the ONLY person in the entire NORDSTROM wing, except for two kids sitting on the couch playing with their cellphones. NO ONE else was there, and when I went into NORDSTROM, aside from 2 employees, I saw no other signs of human life. So unlike several who wrote on this blog, I myself don’t care much for the layout, but there ARE a nice bunch of stores…. ….but not worth a special trip down from Maine anymore. Combined with the economy and the fact that it’s summer, I could see that it could be quiet. Remember, Northshore is on 128 on the way to the Cape Ann towns. With the kind of days we’ve been having, I’d rather be in Rockport, Gloucester or Marblehead than in Northshore Mall! We have the same patterns in NJ. @JF, Actually, I’ve worked at the new Nordstrom since before it’s opening. We had a couple of dead days around the time you mention because the weather had been so crappy prior, that people were just so excited to be out in the sun again. Some of our depts are actually some of the top performing in the entire company, which is impressive given the newness of the Nordstrom brand. 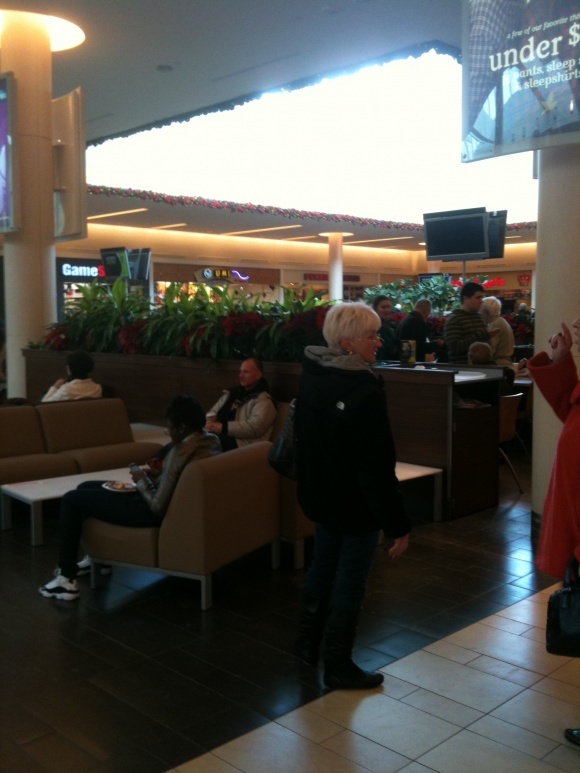 More stores continue to open, and Burton’s Restaurant has opened in recent weeks. It can be a little confusing when customers ask me how to get to Filene’s Basement (“well, it’s the same level as we are, but you have to go upstairs and go back down near the food court”) but it’s really not that complicated. Many of the stores such as H&M and Forever 21 have entrances on both sides of the wing, making them accessible to different sides and wings of the mall. There’s also a good mix of the high end, middle, and bargain stores, and the parking is really not that bad even around the holidays surprisingly. This mall is a far cry from when I moved here 5 years ago. It’s made significant leaps from the “Square One” caliber to Burlington Mall, although still a Saks or Neiman’s away from the Pru. The Liberty Tree mall, which essentially neighbors Northshore(so to speak) is really struggling. Vinny T’s randomly shut down about a month ago,but a look inside showed they essentially just decided not to open one day…A little research and that is infact what they did…Some employees showed up and couldn’t get in. It is a shame that the Liberty Tree mall has seen so much decline…unfortunately, that has been the overall trend in retail. We are trying everything we can to change that!! 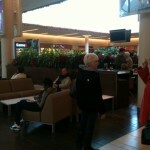 @The Bev Card, it’s the type of CLIENTELE the mall chooses to cater to that causes decline. I knew Liberty Tree was headed down this path YEARS ago – no surprise to me. 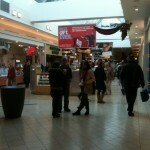 All one needs to do is check out WESTFARMS MALL in suburban Hartford, and see. This mall had the same type of clientele hanging out just as at Liberty Tree- Taubman bought the mall – got the high-end stores to replace the riff-raff, and voila! 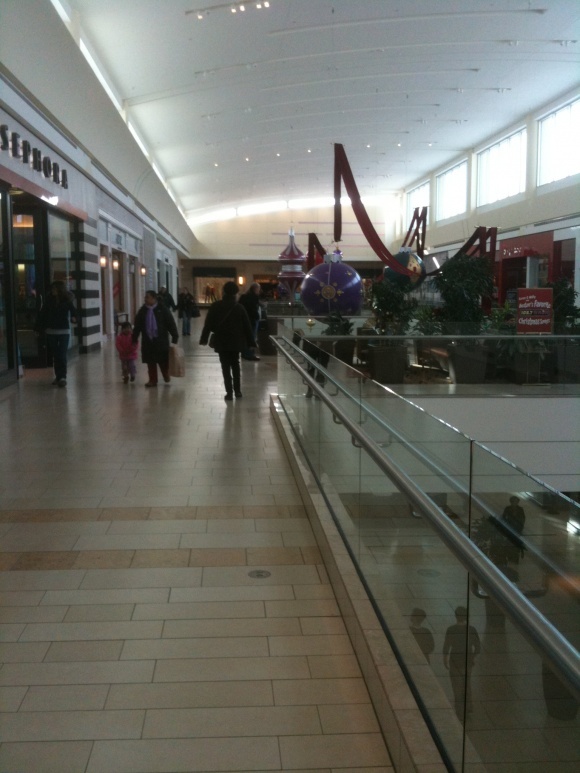 The nicest mall in New England, nicer than Burlington, Natick, Southshore, or Northshore. To me, the management of THIS place got exactly what they asked for. 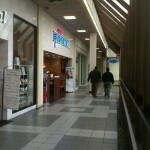 I have so many childhood memories of the northshore mall. Yes, I remember windsor button shop, and I too, loved the huge toy soldiers. One of my favorite pictures from when I was kid showed my sister and me in front of the soldiers. I am trying to remember which store, Filene’s or Jordan March, had a cafe in it, up a short staircase. Do you remember, and if so, what was the name of it? I worked at the old Brooks Pharmacy while I was in college, late 80’s early 90’s. Even to this day I have great memories of the people I worked with and how much work we did for peanuts! Hot looking girls there too. I remember the Northshore mall well from the late 70’s and 80’s growing up. Remember the Lodge, Casual Corner, and that great bakery at Jordan Marsh. Got my ears pierced at the place next to the Gap. Loved the Windsor Button Shop, and could spend hours browsing around in Musicland and Bookends which was next to it. There was no food court, but restaurants spread out. Orange Julius, Brighams, Papa Ginos. There was a grocery store at one end of the mall that turned into a Toys R Us. The Limited was a cool store with those silver mannequins in the window. I loved the displays they put out at Christmas. Yes, you could say that I remember this mall very well! I wish somebody had pictures of it on the inside before they renovated it in the 1990’s. Shocked! Shocked I am that Jordan Marsh was knocked down. All those times I’ve driven past on 128 (and stopped at Kappy’s across the street) and I never noticed the change- guess it’s been a while since I went in. And the previous poster mentioned The Lodge- The Lodge!- I’d completely forgotten about them. Great clothes, says the man who only buys from the Brooks Bros, R. Lauren and J Crew outlets in Tilton (madras, lots of madras). Nordstrom must be a women’s thing- I wasn’t impressed by their Mall of America store when I lived in St Paul. 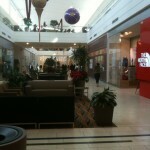 I liked Dayton’s better, as I preferred JM to Macy’s, and Macy’s ain’t bad. 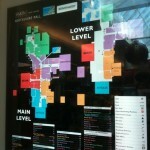 Anybody know the floor layout of the Macys at Northshore Mall? Looks like there was an atrium built for the store, like the one at Burlington Mall. Can somebody please confirm this? 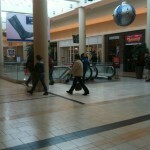 Also read an article in the Globe about Bloomingdale’s considering opening a store at Northshore Mall back in the 80s. Think a Bloomingdale’s would work well at the mall today? Be a good place for a second MA location. Okay, I’ve worked at the mall for three years in multiple stores and I LOVE that you did this. I’m really into old things/abandoned stuff. So my friend and I usually go to offsite a lot to get materials for floorsets etc. And when we’re down there we do some exploring. We can still see an old entrance to the mall, an old dentist office that is no longer in use along the tunnels, and the whole offsite itself is an old area with old signs that used to say “Toyland”. Now, right next to offsite, behind a locked door, there is an old abandoned pool with lockers. I’ve asked the mall people for old maps etc but they aren’t talking. What’s the deal with that old stuff? What was there before? Do we have any access to old maps or photos? I tried to figure out, using your first picture where you were in relation to now, but I just can’t do it. Any more information you have would be amazingly appreciated. @Jackie, A friend of mine is a maintenance supervisor at the mall and after reading your post I asked him about the pool. He said there’s actually a pool and a couple of saunas down there. I asked him to take a few pictures for me. He did not know any history behind the pool or when it was built. I started to google it because I’m also into old/abandoned places and I found one facebook comment mentioning the pool. Here’s the copied and pasted post. The recent death of Esther Williams reminds me of her appearance in a swimming/diving exhibition held at the original North Shore Shopping Center in the summer of 1959. As I recall Sports Illustrated magazine was one of the sponsors of a week long event celebrating the first anniversary of one of the nations earliest suburban shopping centers. A large swimming pool was constructed in the concourse (before it was enclosed) about where Legal Seafoods is currently located. Esther gave several swimming and diving demonstrations along with other synchronized swimming events. I was a sales clerk in the Boy’s Department at Jordan’s at the time and Johnny Unitas and Frank Gifford were seated at a table in my area signing autographs on a Saturday afternoon for three hours. What a great thrill! I’m sure there were many other celebrities there as well but my memory fails. Ted Williams gave a fly casting demonstration … but that could have been at a different time. I had to update this message. I had my friend send me pictures of the pool and it’s not the original one from the 50’s, although that would have been really cool if it was still there. The pool that you saw was Bally’s total fitness, which closed a number of years ago. I guess they just left the pool there and built a new store where the old Bally’s was, leaving no access to the pool except through the tunnel. It’s still pretty cool that it’s just hidden in there, there’s a sauna and lockers too. I was working at the mall back in the 80s when Bally’s was digging the pool. It was the old JJ Newbury’s space. The store I managed rented storage space at Christmas in the service tunnel. I remember all the rats running around, and the smell of diesel fumes from all the trucks. Hey…I worked at that Newbury Comics too, mostly helping out; gov’t ctr. was my primary store….who wrote this? 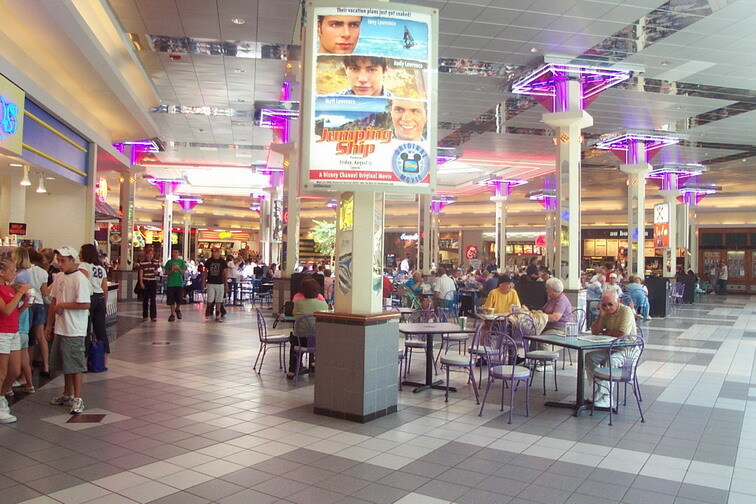 The Northshore Mall (or Northshore Shopping Center, as it was once called) holds so many memories for me… perhaps more than anywhere else in all of New England…. 3) Going to dollar days at Jordan Marsh Basement (which always began on Thursday)… and surviving many, many times that ugly old elevator which took you to the main store ~ I swear it always seemed like it would get stuck … and the smell … yikes! 5) Wondering how a store such as CB Perkins Tobacco could exist, seeing that, aside from those fancy lighters they had in the windows, made its’ business off selling cancer sticks…. BTW, they were located next to Sacketts Hallmark and the Gap…. 6) The globes at the London Harness Company…. 9) Those silly Garfield slippers I acquired via Kinney Shoes…. 10) Listening to the organs at Scotti Piano and Organ… and marveling at the player piano ~ no hands required! I could write forever, yet please take a moment to reflect on the memories which I provided… also, before I forget, what was the name of that kiosk across from Fanny Farmer and Jordan Marsh bakery that carried those indulgent smelling coffees? Who was it? You know, across from 5-7-9, Open Country, Chess King, etc.? I worked at Bookends (next to Sears) from about 1979 to 1989. A lot of memories also. A lot of people forget that when Allied owned the mall they put parts of the Christmas Village on display for the holidays. Some say it was lost, but I think it was stored in the storage areas off of the service tunnel. After Allied sold the mall the village miraculously appeared in Boston after being “lost” for years. @Mallguy1980, How can two Northshore and Liberty Tree be Competing if they are both owned by Simon? I am trying to remember the name of a upscale men’s clothing store from the 1970’s . It was located near the Jordan Marsh end on the left side just a couple of stores before JM. It sold very nice men’s clothing. 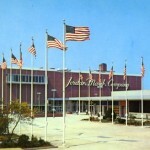 It was not kennedy’s, Anderson little, Miltons, . If anyone remembers the name please post it.